Oplev den franske riviera med klassisk bil på en halv dags privat tur fra Nice. 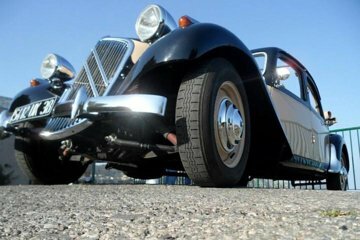 Sink ind i en 1953 vintage Citroen Traction cabriolet - en af ​​kun 14 tilbage - og føl vinden i dit hår som din chauffør whisker dig rundt om Cote d'Azur. Vælg den anbefalede rejseplan for at besøge højdepunkter som Monaco og middelalderlige landsbyer, eller accepter din egen personlige rute med din chauffør. For den ultimative oplevelse, opgrader til en heldagstur. One of the best things we did on our trip. Our driver was fabulous and made sure we saw as much as possible even making sure our stop for food had a view! Salvatore was our our guide. WOW what an Amazing experience. We left from Monaco and even with all the insane super cars we stood out. Every where we went people waived loving the car. Salvatore was exceptional and took GREAT care of us. Educated us on the area and took us to some beautiful spots. We even got to see a Classic Car restoration place and met NEW friends that we will have for life. We Love cars To see the French Riverea is one thing but to see it like a movie star is a whole other level. Mary, the booking agent was on top of every communication. So much so we hired Salvatore again to take us to Cannes and St Paul De Vence. We would have take the car again except the weather was rainy. They even got us to the airport the next day. This was everything we expected the driver was friendly and very knowledgeable, the car drew lots of attention, we felt and looked like VIPs. Do, do experience this for yourselves you won't regret it.